It seems clear that the Democrats would happily destroy the country rather than accept losing it at the ballot box. As the “Russian Collusion” excuse for Hillary’s loss fails for want of evidence (and common sense) as did her “misogyny” claim before it, Hillary’s pal, Governor Terry McAuliffe, obviously thought he had another keen plan to keep his party from utter ruin. Instead, he is more likely to have stirred up a whirlwind, which will sink his party even further in the voters’ eyes. Led by Charlottesville Deputy Mayor Wes Bellamy (a McAuliffe appointee to the local school board now on leave for racist, sexist, homophobic tweets, the city council narrowly approved removing a statue of Robert E. Lee from a city park. The move was opposed by traditional nationalists who think erasing history and disparaging a man who did so much to restore peace at the conclusion of the Civil War is wrong. The city is a Democratic town, run by a Democratic machine. Its elections are typically settled in a Democratic primary. The GOP is a non-factor. Of the three City Council members who voted in February to remove a Robert E. Lee statue from a town park, two who thereafter faced re-election are now gone. One chose not to run. The other lost in a landslide. The lone remaining anti-statue vote, who did not face re-election, was Vice Mayor Wes Bellamy, who recently had to leave his high-school teaching job over a history of bigoted, anti-white tweets. He is assumed to have no political future either. Notably, Mayor Mike Signer, who declared Charlottesville a “capital of resistance” shortly after Mr. Trump’s inauguration, voted to keep Lee’s statue. All this might suggest the anti-statue cause was not a popular one with the town’s liberal majority. Removing the statue also, apparently, was something a ragtag band of nutters thought was an issue on which they could capitalize. They sought and obtained a permit under the organizational banner. “Unite the Right” to demonstrate their opposition. The leader of Unite the Right, Jason Kessler, was until late 2016 active in the far left Occupy movement, Obama’s Organizing for America, and has the same name as a reporter for CNN sported. The debacle ensued; the peaceful majorities on both sides were shouldered aside by the violent thugs on the extremes, with the Klansmen and neo-nazis being more vocal and recognizable by their signs and costumes. Since one of their number appears to have been responsible for the (mercifully) sole fatality, the white supremacists and neo-nazis seem to have been the more violent group. But the entire incident had almost nothing to do with the issue of what should happen to Charlottesville’s statue of General Lee (who would have been as disgusted as we are by the extremists of both sides). This incident is of a piece with the mindless violence at Berkeley and other university campuses. 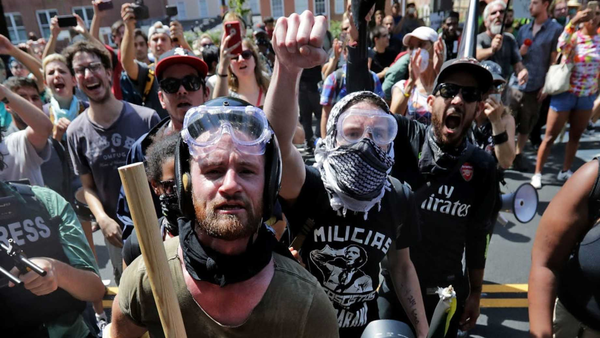 The nihilists and anarchists of both sides want bloody conflict and vandalism, and most of the Democrats and the anti-Trump Republicans and the national media are trying to pin the phenomenon on Trump. In the melee that followed, a mentally disturbed man plowed his car into the crowd. He’s been charged with second-degree murder, and it is for the trial to determine whether he was responding to fear or deliberately targeting the Antifa crowd. The media to its shame, played along with the Democrats’ script. Antifa gangs beat up reporters to stop them from filing their violent acts, something barely reported. (Taylor Lorenz of The Hill and a photojournalist from CBS Richmond). The operatives’ motive is social upheaval. It is purely opportunistic to get radical social change because they see the American system as evil. It matches its ally,Antifa’s, goals. #Charlottesville was a major problem, but most Americans should get some probabilistic perspective on this. Don't let someone petrify you that you might be a victim of a hate group attack unless you follow their counsel. It's simply HIGHLY unlikely. Adding up all of these nutjob members from both the left and right hate groups, we get much less than a few basis points. There are far more murders and gang members, or actual rapists out there, and most of us don't stay up all night dwelling about that. Additionally mapping this out, most Americans (except the small overall fraction who live in Manhattan, New York or Los Angeles, California) don't live even within 40 or so miles of the nearest random hate group. “Dear Media: Go to an Antifa rally and tell them you support Jews and Israel. Let's see who, as Romney said, is in a 'different moral universe' than the Nazis. The Nazis are fringe. The anti-Jewish left is basically every campus in America. It's not 100 semi-employed Nazi losers. It's tens of thousands of professors getting money from gov't subsidized student loans. The antifa anti-Semitic campus movement is growing, not shrinking as the organizers of the revolution seek to draw in ever more converts to their cause using the "intersectionality" ploy. Indeed, days after the first very biased media coverage, some media been forced to pull back. The Los Angeles Times published a report from various participants and observers documenting that there was violence on both sides, a result which was sure to follow police inaction. And the New York Times even implicitly backtracked on its claim that when Trump charged that both sides engaged in violence he was making some sort of“moral equivalence” argument. The new article today seems to acknowledge the inadequacy of the 2-day-old article. The older article seemed intent on pushing back Donald Trump for talking about the "alt-left" as well as the "alt-right." The term "false equivalence" -- which was a big media talking point earlier in the week -- appears in the older article. I thought "false equivalence" was being used to say, essentially: When one side is worse than the other side, you're not even allowed to compare them. Now, Trump never said, "the 2 sides are equivalent." He didn't say "equivalent" and he didn't even say "2 sides." He said, "We condemn in the strongest possible terms this egregious display of hatred, bigotry and violence on many sides." But those who were pushing the "false equivalence" idea needed to rely on the idea that one side is bad and the other is good, and they needed to minimize antifa. Now, the NYT admits the left has a violence problem. Good. Nevertheless, the Times is still searching in vain for evidence that Trump is a racist. Since that melee in Charlottesville statues are being defaced around the country. Three far leftists pulled down a statue in Durham of a man who, post-Civil War, started a college for freed blacks, which later became Duke University; Abraham Lincoln’s bust was burned; even Joan of Arc’s statue was defaced. And Al Sharpton is calling for a cessation of federal funds to maintain the Jefferson Memorial in Washington. Nancy Pelosi who had no problem with them when she was majority leader of the party, which controlled all three branches of the government, now calls for removing statues of Confederate leaders from the Capitol’s statuary hall. In the meantime, surveys show the majority of Americans, including more blacks than not, do not want the statues removed. I have to believe that as these thugs grow ever more ubiquitous spines will harden against this nonsense. At the moment, fewer Americans identify as Democrats, the party’s coffers are running dry, and Trump supporters are still supporting him. It seems clear to me that the Democrats would happily destroy the country rather than accept losing it at the ballot box. Is it just me? I cannot see such thuggery persuading the voters in the states Hillary lost to switch back to her violence-supporting party or those who voted for pride in our nation and support for its constitutional guarantees of equal rights to jump ship to join anarchists, racists, communists, and rule by violence.